Star Wars: Customizable Card Game (SW:CCG) is a customizable card game based on the Star Wars fictional universe. It was created by Decipher, Inc., which also produced the Star Trek Customizable Card Game and The Lord of the Rings Trading Card Game. The game was produced from December 1995 until December 2001. Operation and oversight of the game was then taken over by a Decipher created volunteer group called the Star Wars Customizable Card Game Players Committee. To date, the Players Committee, or PC, still runs the game and creates new cards known as "virtual cards" that are released online in PDF format, and can then be printed and played with. You can also play SW:CCG online: Holotable.com is official Player Committee platform. Star Wars CCG was first released in December 1995 after game play rights were purchased from a game designer. Over the years, Decipher added 11 full expansions to the original card base, as well as numerous smaller expansions, special purpose sets, and promotional releases. The last set, Theed Palace, was offered in the fall of 2001. The game spanned all of the classic Star Wars trilogy (A New Hope, The Empire Strikes Back, and Return of the Jedi) as well as The Phantom Menace. During several years of the game's run, between 1995 and 1998, it was a top-selling CCG, second only to Magic: The Gathering and occasionally surpassing Magic, according to both InQuest and Scrye magazines. At the end of 2001, after much negotiation, Lucasfilm chose not to renew Decipher's license to use the Star Wars intellectual property. The license was granted to Wizards of the Coast, which used it to create their own game, the Star Wars Trading Card Game. Decipher can no longer legally create new expansions to SWCCG; many cards that were in development can never be released to the public. As of 2016, SWCCG still has an active playing community. The game is administered by a Players' Committee, which interprets rules, organizes tournaments, and releases "virtual expansions" which give alternate game text for existing cards. The new "virtual cards" function as entirely new cards and keep the game environment constantly evolving. The "virtual card" overlays are available for free on the Players' Committee website, though players must have the original card to use its "virtual" version. To date, the Players' Committee has produced 8 blocks of virtual sets (over 20 total sets). SWCCG is also available online on Holotable. Each game requires one player to play the Light Side of the Force while the other plays the Dark Side. In friendly play, a player can specialize in one side or the other, but for tournaments, players need both Dark and Light decks. This two-sided aspect is rare in customizable card games (Netrunner being the other notable example). The action of the game occurs at various "Location" cards (both interstellar and planet-bound) familiar from the Star Wars Universe. Locations can be deployed as the game progresses; furthermore, most locations come in both Dark and Light-side flavors, and an on-the-table location can be "converted" (changed to the other side) at any time. Most locations affect game play in some way; all also provide "Force icons," which represent the amount of "Force" a player can activate per turn. Force is the game's resource, similar to "mana" from Magic: the Gathering; however, it is executed quite differently and is the game's defining trait. Each unit of "Force" is simply a card from the top of a player's deck, placed off to one side in the "Force Pile." When used to deploy something, each unit of Force is placed on another pile, the "Used Pile," which then cycles back to the bottom of the deck. Unused Force remains in the Force Pile, and can be conserved for the next turn or drawn into hand. The objective of the game is to force the opponent to discard all of their Life Force (consisting of Reserve Deck, Force pile and Used pile). This is accomplished via "Force Drains" (forcing the opponent to discard cards by controlling, unopposed, a location with their Force Icons on it), battling opposing characters, and resolving certain climactic situations (for instance, freezing a character in carbonite, winning a pod race, dueling a Jedi). The game system also features "Destiny draws," which represents the elements of chance, uncertainty, luck, random chance and the Force. Each card has a destiny number, from 0 to 7, at the top-right corner (except locations, which count as destiny 0), and rather than using dice for generating random numbers, players "draw destiny" from the top of their deck, revealing the top card and using its destiny number as the result. This is used for a variety of purposes, from determining weapon hits to mandatory losses your opponent incurred to resolving whether a character passes a Jedi Test. The drawn Destiny card goes to the Used Pile and is recycled into the deck. Through this system, a skillful player can legally count cards, remembering where the high-destiny cards are in the deck. Finally, the stronger (or rarer) cards generally had lower Destiny values (though there were exceptions); as a result, less-experienced (or economically challenged) players are more likely to find that "The Force is with [them]." While Decipher oversaw the game, no card was ever banned from tournament play. Instead, when a card or strategy was deemed abusive or too powerful, Decipher chose to release "magic bullets," new cards which were specifically designed to counter the offending strategy. In some cases, Decipher also used errata, modifications to game text of a card that supersede the actual printed version. The use of errata also contributes to a steep learning curve, since players need to be aware of the current meta-game at all times. Finally, the game was known for its quirky humor and inside jokes: one card, depicting Luke's protracted hand-stand during The Empire Strikes Back, was printed with all text upside-down. Another described a character as being Boba Fett's twin brother, since the same actor (Jeremy Bulloch) played both roles. Premiere (1995) - This was the first set for the Star Wars CCG and included the characters of Luke Skywalker, Han Solo, Leia Organa, C-3PO, Obi-Wan Kenobi, and Darth Vader as well as many other very useful cards that formed the core of the game. Perhaps the most potent strategies was to pair Vader and Grand Moff Tarkin at an important location. Acting in concert, they can cancel an opponent's destiny draw (unless Vader is targeted by Uncontrollable Fury, which was released in the Cloud City expansion). All of the images from this set were taken from A New Hope. This set, along with A New Hope and Hoth, were sold in packs of 15 cards that retailed for US$3.00. A New Hope (1996) - This set featured additional cards taken from the first Star Wars movie. Important debuts in this set included Chewbacca and R2-D2. Also of note were the introduction of the Death Star as a system card, the introduction of creatures, and a new mechanic that allowed for the destruction of entire planets. Hoth (1996) - This was the first set to include images from The Empire Strikes Back. It was also the first set to introduce the mechanic of a "persona," a version of a main character with alternate abilities (e.g., Commander Luke Skywalker vs. Luke Skywalker). Also included in this set were the immense AT-AT walkers. Another new rule was the "Hoth Energy Shield Rules" which prevents the Dark Side player from deploying his cards on the first four "marker" Hoth sites, and all interior Hoth sites; unless the Main Power Generators is "blown away". Dagobah (Wed April 23, 1997) - This set featured cards from the middle part of The Empire Strikes Back. Significant cards included Yoda, another new version of Luke (Son of Skywalker) and all of the bounty hunters, their ships, and weapons (except Boba Fett). This set was also the first to be sold in packs of 9 cards with an original retail price of US$2.50 per pack, where the last card in the pack would always be the rare. This was to ensure that players and collectors could acquire more rares and fewer commons and uncommons. When originally released, this set developed a bad reputation among players because of the introduction of many new strategies that focused the game on deck manipulation at the expense of the intense battling that had originally made the game so popular. Cloud City (1997) - This set included new versions of Han and Leia and also introduced Lando Calrissian as a character card in the game. He was also unique in that he had both Light Side and Dark Side personas. It also finally added Boba Fett to the game (although he had been available as a preview card in the First Anthology released earlier in the year.) This set also introduced "dueling" as a major strategic mechanic for the Dark Side and provided for the possibility that Luke could be turned to the Dark Side. Cloud City also attempted to correct the abusive "numbers" strategies prevalent since the release of Dagobah. Due to a large print run, this set, as of 2009, is still very easy to acquire. Jabba's Palace (1998) - This was the first set to feature cards from Return of the Jedi and focused on the opening scenes of the film where the heroes tried to rescue Han from Jabba the Hutt. Jabba himself was an important card, as was the new version of R2-D2 (Artoo), but on the whole this set was seen as being fairly weak, especially from a tournament perspective, by players who complained that there were simply too many aliens that had little or no competitive use. This is, as of 2009, the cheapest and easiest set to purchase. Special Edition (1998) - This was the largest set since Premiere and the first to introduce new starter decks (which included many cards that could only be found in them). This set was seen as something of an overhaul of the game since it changed some game terms and attempted to make the entire play experience more streamlined through the release of a comprehensive rulebook and glossary. The most notable addition in this set was the introduction of the "objective" mechanic. These cards allowed a player to start many more cards and provided a movie-based goal for a player's deck. Many players praised this addition, arguing that it made little-used strategies (like freezing people in carbonite) useful. Others argued that it limited creativity and led to cookie-cutter decks based around various objectives that all looked and played the same. This set introduced the widely popular "Darth Vader, Dark Lord of the Sith" persona. Endor (1999) - This was the first of two sets to focus on the latter two-thirds of Return of the Jedi. It included a vast number of characters and vehicles that were designed to be useful in battles. Upon release, this set garnered a poor reputation because of the sheer number of ostensibly new but seemingly redundant characters and vehicles contained therein. However, its reputation has improved since then, as later expansions have allowed for new decks featuring large amounts of Endor cards, and it is, as of 2009, one of the more valuable and expensive sets to purchase. Death Star II (2000) - This set was the second to focus on the end of Return of the Jedi and along with Endor forms a stand-alone environment, in which all of the cards from those two expansions can be played independently of the other sets. This was also the first set to feature ultra-rare cards (Luke Skywalker, Jedi Knight and Emperor Palpatine). The inclusion of these two very powerful and iconic characters, in addition to many useful supplementary cards, coupled with general praise for its elegant design, has given the set lasting appeal and led to it being, as of 2009, one of the more expensive sets to purchase. This set, and all after it, were sold in 11-card packs for a retail price of US$3.29. Tatooine (2001) - Tatooine was originally scheduled to be a set based on the Skywalker family; this idea, however, was abandoned when Decipher decided to allow for elements of the film The Phantom Menace, the first of the prequels, to mix with the "Classic Trilogy" cards, at Lucasfilm's request. Thus, this set includes Qui-Gon Jinn, Darth Maul, Padmé Naberrie, as well as a younger version of Obi-Wan, and was heavily focused on "pod racing." Anakin Skywalker was not included either in this set or the following ones to avoid problems with having both him and Darth Vader in the game (ultimately, no Anakin card was ever printed). This set, which contained fewer total cards than previous expansions, seems to have had a relatively large print run, and thus it is relatively easy and inexpensive to acquire. Coruscant (2001) - Coruscant focuses on events from the middle of The Phantom Menace, especially Senatorial conflict. A very limited print run along with powerful strategies has made it by far the most expensive set and hardest to acquire. There are a number of notable cards in this set, including new versions of Queen Amidala, Qui-Gon, and Darth Maul as well as the introduction of Mace Windu. Theed Palace (2001) - This was the last set produced for Star Wars CCG. The most popular and notable card in this set is Darth Sidious who was, at that time, not considered by Decipher to be the same person as Emperor Palpatine or Senator Palpatine in the "game universe." For gameplay reasons, these three cards have still not been combined into one persona. This set is also somewhat difficult to acquire. Decipher also reprinted four sets (Premiere, A New Hope, Hoth, and Dagobah). These reprinted cards sometimes had slightly different game text (or other parts of the card) to reflect errata that had been issued, and all of them had white borders which indicated an unlimited edition. Also, packs of revised A New Hope and Hoth were sold in 9-card packs rather than the original 15. Premiere Two-Player Game (1995) - This set included two preconstructed decks and a Premiere booster pack. The decks included six unique cards available only in this set. 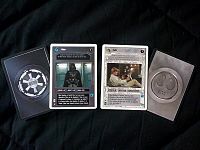 Included beginners' versions of Luke and Vader as well as the card Vader's Obsession which would later become very powerful with the introduction of dueling. The entire set was packaged in a board game style box and was, indeed, often sold alongside board games at many retail stores. Jedi Pack (1996) - This 11-card pack was released as a thank you to players and was distributed for free via an email offer. It contained versions of Han, Leia, Tarkin, and Motti with very limited functionality, but nonetheless allowed players to play with the, at the time, difficult to acquire "main characters." The general consensus is that there are few truly powerful cards in this set, with the possible exception of "Gravity Shadow" (although "virtual" versions of some of the Jedi Pack characters have since become useful). The Empire Strikes Back Two-Player Game (1996) - Like the Premiere Two-Player Game, this set included a light and dark side deck which included well as seven premium cards as well as a Premiere booster pack. There were limited functionality versions of Chewie and Veers, but the true star of this set were the Imperial Walkers and the card Walker Garrison. The Imperial Walkers were low-deploy cost versions of AT-ATs that facilitated the use of Walker Garrison, an extremely powerful card which increased force drains on Hoth for the dark side to devastating levels. This is the centerpiece of several decks and continues to be very powerful. Rebel Leaders pack (1997) - This was a two card set that featured Red Leader in Red 1 and Gold Leader in Gold 1. These ships were originally very powerful, but their utility has decreased somewhat over time. The cards were given out free at many major conventions where Decipher had a presence. Also Decipher had a mail-in offer on their website so that players could obtain these cards. Official Tournament Sealed Deck (1998) - This set included 18 premium cards, four Premiere packs, and one A New Hope pack. As the name implies, this set was used in tournaments. Each player would be assigned a Side and would open their packs. They would keep their Side's cards and pass the rest to the next player, who would be the opposite Side. Once all of the cards were sorted, the players would create a deck with the cards they had. Enhanced Premiere (1998) - This set featured six new cards: versions of Luke, Han, Leia, Obi-Wan, Vader, and Boba Fett with their personal weapons built into the character card. These six cards were incredibly powerful at the time of release, and indeed, many of them eclipsed the power of the original character cards. Several of these EPPs (so called because they are found in Enhanced Premiere Packs) are still very useful in competitive play. Each character came with four Premiere booster packs. You could tell which character you were getting through the die-cut box face. Enhanced Cloud City (1999) - This set featured 12 new cards, three per box (which came with four Cloud City packs). The highlight of this set was the introduction of bounty hunter character cards wielding their signature weapons. Like Enhanced Premiere before, these new characters were generally more powerful than their original versions. Also of note, were the two Cloud City objectives in this set, one of which would dominate the tournament play for many years. Enhanced Jabba's Palace (1999) - This set also included 12 new cards. The "face cards" were versions of Luke, Leia, and C-3PO from the Jabba's Palace scenes in Return of the Jedi as well as the first ever character card of Mara Jade, a very popular character from Timothy Zahn's series of novels. "Mara Jade, The Emperor's Hand" easily became the most popular card in this set and for a while was arguably the most popular card of any set. Jabba's Palace Sealed Deck (2000) - This was new version of the Tournament Sealed Deck themed around Jabba's Palace. The set included several Jabba's Palace packs and 20 premium cards (10 Light Side and 10 Dark Side). These were used in the same format tournaments as the Tournament Sealed Deck. Reflections II (2000) - 52 new cards were featured in this set. Each Reflections II pack came with two of these new cards (along with a foil version of a popular card from a previous expansion set as well as a random assortment of other old cards). Many of these premium cards were characters, ships, and objects from the Star Wars expanded universe. As with Mara Jade, models were used for these characters which included the likes of Talon Karrde, Corran Horn, Dash Rendar, and Prince Xizor. This set also introduced "combo" versions of past interrupts, effects, and characters which combined two different cards into one. These combo cards were very popular and made the individual versions of the cards see less gameplay. Third Anthology (2000) - This boxed set included six new cards, including two new objectives based around the Death Star. The most popular card in this set is Artoo in Red-Five. It is unique and very useful for having a destiny number of 0 or 7, making it the card with the absolute best destiny number in the game. Reflections III (2001) - Included with the foils and random cards from previous expansions found in all Reflections sets were 104 new cards (including "Boba Fett, Bounty Hunter," "Leia, Rebel Princess," and "Han, Chewie, And The Falcon"). Among the new cards were characters, a vehicle, and a starship with "maintenance cost". These cards were extremely powerful (some fans would argue "broken" in their power level) but you had to pay each turn to keep them on the table. The other notable addition in this set were defensive shields, cards that were separate from your 60-card deck and were designed to counter abusive strategies. This set had a limited print run and is now the most expensive to purchase on the secondary market. Premiere Starter Deck (1995) - Random 60-card decks containing cards from the Premiere set. First Anthology (1997) - This set featured six preview cards that, while at the time were unique, were later found in the Special Edition card set. The most popular one, at the time, was the first appearance of Boba Fett. Second Anthology (1998) - This product also featured six preview cards, one from Special Edition, two from Endor, and three from Death Star II. It also included eight packs of Unlimited Premiere, two of Dagobah and two of Cloud City. Special Edition Starter Deck (1998) - 60-card deck made of cards from the Special Edition set, made up of "Fixed" rarity cards, unique to this product, and randomized Commons, Uncommons, and Rares. The product also came with an updated glossary containing rule erratas and special rulings. Reflections (1999) - Each 18-card pack of Reflections contained one rare card from a previous set that was deemed to be a fan favorite after a poll on Decipher.com was taken. These cards were overlaid with foil that made them shine in the light. The remaining 17 cards were a random mixture of past cards, thus making it possible to find packs with multiple rares. Some have even found packs containing only rares. Death Star II Starter Deck (2000) - Preconstructed 60-card decks made of cards primarily from the Death Star II and Endor sets (although it contained a few cards from previous sets). Unique to these decks were the Admiral Piett and Admiral Ackbar cards. Decipher's prize support for sanctioned tournaments initially consisted of unique T-shirts with card images printed on them along with some product (premiere packs). As time went on, these were replaced with the more economical but still appreciated FOIL versions of popular cards. State championships were also held annually, and Decipher supported these events with prizes including exclusive carrying cases and binders, which have become tough-to-find collectors items. Despite the release of The Phantom Menace in 1999, Decipher planned to continue to release expansions based on the original trilogy. This decision was changed following the success of the Death Star II expansion and urging from both fans and LucasFilm. Three expansions and one mini-expansion were planned for release through to the end of their license agreement with LucasFilm at the end of 2001. Shadows of the Empire (August 2000) - Mini-expansion of around 20 cards based on the book, Shadows of the Empire by Steve Perry. This was meant as an intermediate expansion to test the grounds of expanded universe material. This expansion merged with "Reflections II" in the form of 16 premium cards. Skywalkers (November 2000) - The first full expansion following "Death Star II" based on a character group found in the card game, Skywalkers was designed around Luke Skywalker, Leia Organa, and Darth Vader/Anakin Skywalker. It was to be the first expansion to use the "Lichtenstein" game mechanic which was to use new cards to add new capabilities to character cards and promised to allow them to be used in new and 'intriguing' ways. The ultimate fate of this mechanic is unknown. Some elements of this expansion were merged with the "Tatooine" expansion based primarily on The Phantom Menace. Jedi Masters (February 2001) - The second full expansion based on characters, this on Obi-Wan Kenobi, Yoda, and Emperor Palpatine. Following the failure to implement the "Lichtenstein" mechanic and the shift toward more prequel expansions, this expansion was canceled. Scoundrels (September 2001) - This was the last expansion planned by Decipher and suffered the same fate as its predecessor. It was designed to focus on Han Solo, Lando Calrissian, Jabba the Hutt, and the bounty hunters. This expansion never entered into the design phase. Reflections Gold (December 2001) - Decipher lost their license to print SW cards to Wizards of the Coast in January 2002, and these cards were not produced in time before production on them had to cease. Scans of Reflections Gold cards can be found online. First set to be able to change card titles/names. First set to feature new card images. There are two major constructed formats for tournament play - Open and Classic, which differ only in deck construction rules. In the Open format, every card is legal. The only deck restrictions are that each deck must contain 60 cards from the same side of the Force and no more than 1 Objective card. Another type of tournament was a sealed deck tournament. This would consist of players purchasing a Sealed Deck box (see above) and using its contents to construct a deck. The World Championships and most events in the World Tournament Circuit are played in the Open format. Below is a list of all Open format World Champions and Runner-up finalists. There has been a total number of 16 champions (out of 19 World Championships). There has been a total number of 14 runner-ups (out of 19 World Championships). All but 2 of the 19 World Championships were held in the United States, with the other World Championships being held in Germany and Canada. In February 1997, Decipher launched the "Design-A-Card" contest. People from all over the world would have an opportunity to design the card they always wished were a part of the Star Wars Customizable Card Game. Decipher said the winner of the contest would win a display box of the "Special Edition" expansion set, and the winning card design would actually be printed and included in the "Special Edition" expansion set. On May 23, 1997, Guy Kargl was announced as the contest winner, with his S-Foils card design. In November 1998, Decipher released the Special Edition expansion set. Decipher produced two other TCGs based on the Star Wars universe: Young Jedi, based on the second Star Wars trilogy, and Jedi Knights. Neither of these games matched the popularity of SW:CCG. Both were discontinued when Decipher lost the Star Wars license. In April 2004, Decipher announced a new game, Wars TCG, based on the game mechanics of SW:CCG. Wars TCG is set in a proprietary science fiction universe created specially for the game and owned by Decipher. Despite initial sales and critical success, the game failed to catch on with players and set 2 sales were lackluster. After the second set, the game was placed on "indefinite hiatus" by Decipher at the beginning of May 2005, and was officially canceled in September 2005. There are still ebooks by Michael A. Stackpole and Chuck Kallenbach on the Decipher website.